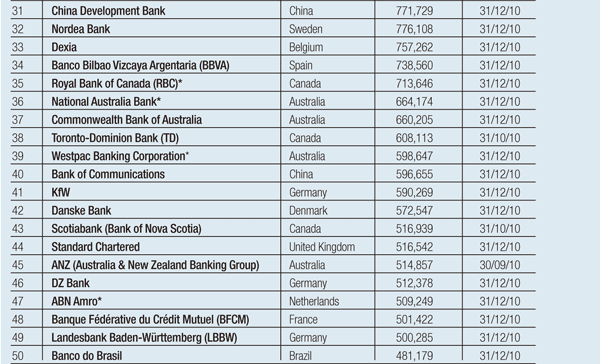 Global Finance presents its ranking of the World’s Biggest Banks. Assets sizes of the world’s biggest banks have stabilized, after three years of deleveraging and asset write-downs. The 50 banks which comprise Global Finance’ s list of the World’s Biggest Banks notched up $62 billion in assets in 2010, almost unchanged from last year. Both top-ranked BNP Paribas, and The Royal Bank of Scotland (down three positions at number 5) saw their total assets fall over the course of the past year, but most of the top 50 marked time. 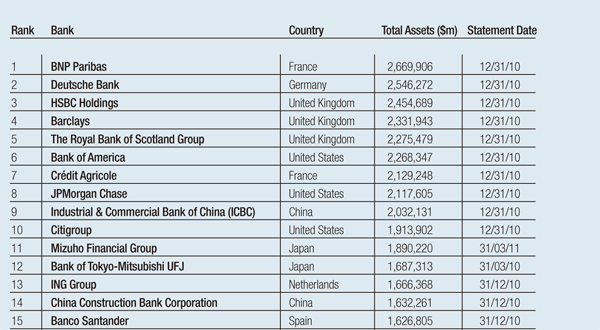 The top ten banks had combined assets of $23 billion, the same as last year. The 50th bank on the list, Banco do Brasil, showed assets of $481 billion—similar to last year’s 50th ranked institution, China’s Bank of Communications. Chinese banks continue rise up the list. Industrial and Commercial Bank of China takes 9th place in this year’s list, compared to 11th last year. Six Chinese banks are included in the list of 50, holding $8.2 trillion in assets, representing 12% of the total. This is up from around 10% last year.